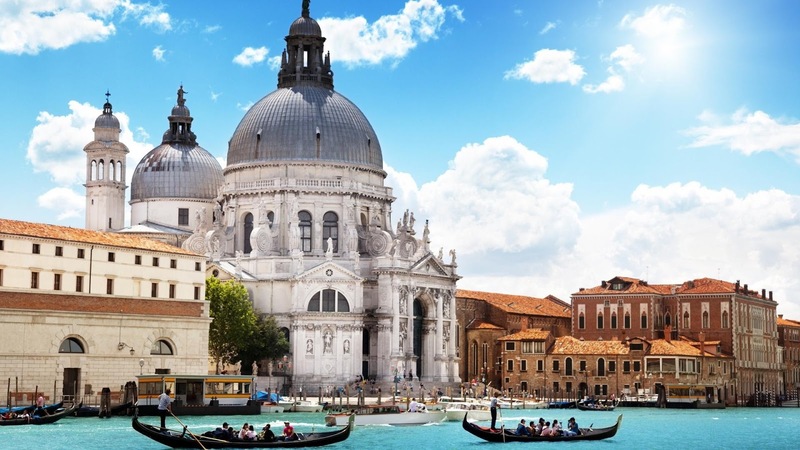 Hello readers, let's go find out "Top 5 most beautiful architectural works around the world." This architectural masterpiece of the achievements of people leaving, attracting tourists from all over the world come here to explore, visit and tour. This is a symbol of Tehran - Iran's capital, with elegant architectural drawing, delicate. Inside the tower there is a museum for touriststo visit. Azadi Tower is a unique architectural symbol of the capital of the State Tehran Iran, located at the entrance to the capital Tehran. 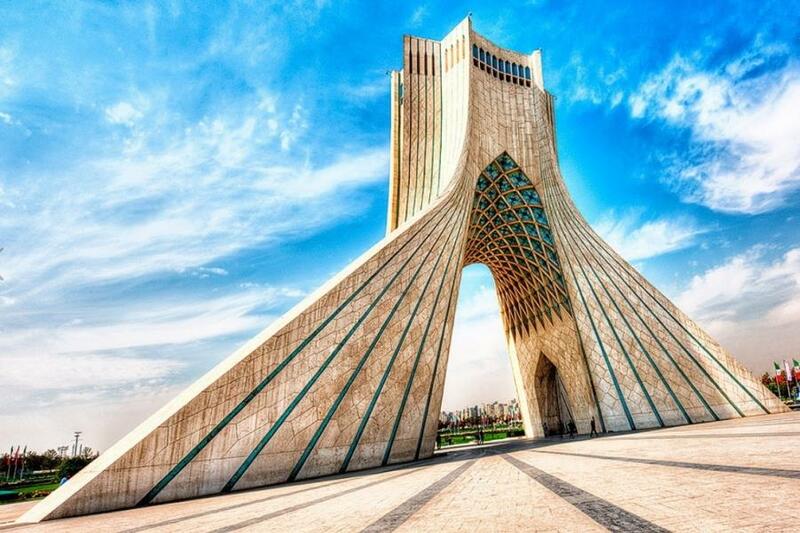 This work was built in 1971 on the anniversary of the birth date of 2500 years of Persian empire, the tower "Gateway to Iran" also known under the name of the tower Shahyad means "the King Memorial Shahs". The entrance of the tower is located directly under the ground at the main barrier to the basement. The black walls stood solid and monolithic space populations make up a majestic atmosphere. The big heavy door opens a light catacombs where a yellow light with a fearsome wilderness. Each lighting lamps are made of different materials: gold and enamel objects, items elaborately painted ceramics, marble. There are about 50 such items are selected in the treasures of the Iranian State. They are preserved in perfect conditions and each item represents a particular historical period in Iran. Sultan Ahmed Mosque (known as Blue Church) conquered visitors with splendid arches, gorgeous tiles. These are sights not to be missed when to Istanbul. As one of the most prominent feature on the skyline of Istanbul, Sultan Ahmed Mosque startling in both scale and scope. More commonly known as Blue Church (Blue Mosque), this project was built under Sultan Ahmed I of the Ottoman Empire and completed in 1616. The goal of the original architect is building a place great religions with prominent Islamic characteristics. Walk from the Hippodrome to get passionate views on Cathedral Green. Looking up six towers and domes that raised ladder in the center of the building and you will see that the designers had outstanding success in their efforts to impress everyone. Go through the stone wall surrounding the mosque on the pitch. During the fasting month of Ramadan, this yard is always crowded after sunset. Inside, the mosque there is the tomb of the founder, who died just a year after his masterpiece was completed. Visiting madrasa, is used as a theological school and hospice. However, most features tiled interior: More than 20,000 blue ceramic tile designs with over 50 different tulips were brought to the nickname for this mosque. The terrace of the building is painted blue and the sun is dispersed by hundreds of stained glass windows create an enchanting spectacle. Blue Church Sultanahmet tram station is only a subway station and City Old a short walk away. Free admission, but as in any religious building, all visitors are required to show respect and caution. Please keep quiet and take off your shoes and put them into plastic bags provided at the entrance. Women are required to cover your head and scarves are available at the entrance. This place forbidden to use the camera flash. If desired, you can raise money to help pay for conservation Blue Church when you leave here. Blue Church remains active as a place of worship, so the non-believers are not allowed in this location in the daily prayer meetings. On summer nights, you can hear a lecture on the history and see the light show spectacular. 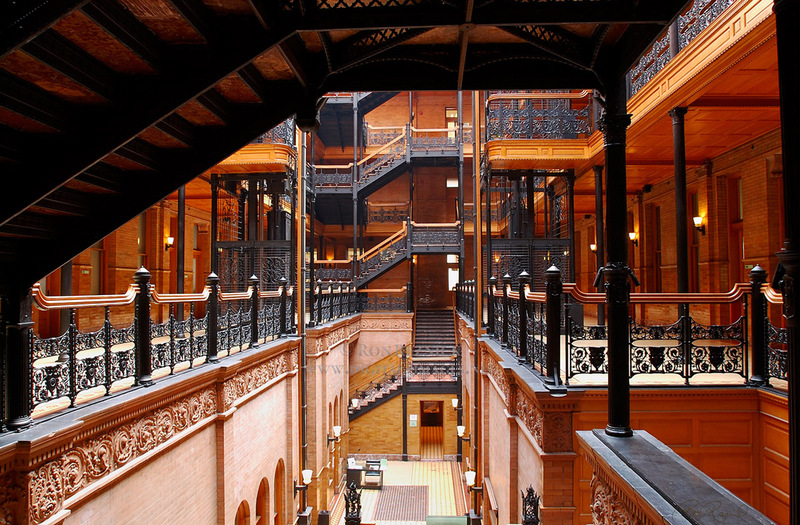 Bradbury Building is the oldest in Los Angeles has an impressive interior, has appeared in several films such as Blade Runner. It is located in the heart of Los Angeles and not attracted by the appearance of brown brick buildings but inside the equipment contains beautiful furniture. Unlike other buildings, you must take the time to go inside, where intricately carved wood, polished and ironwork light was taken from a house in the middle dome. The building was originally designed Sumner Hunt and is embellished by George Wyman. The building is owned by millionaire Lewis L. Bradbury. But Bradbury has died before the building was completed. This is the oldest commercial building in the center remaining Los Angeles. "Roof of Dubai" - Burj Khalifa Tower is the new symbol of wealth, luxury and the height of the city's Arab giants. Not only championship in height in Dubai, Burj Khalifa tower was the tallest building in the world at the present time. The actual height of up to 828 meters of it - about 200 meters higher than the second place is the tower Shanghai (Shanghai Tower). One other interesting statistic, Burj Khalifa tower that is 3 times higher than Effeil famous tower in Paris, France. Inside the world's tallest tower is 163 floors, 304 hotels and 904 apartments. Also this place has about 3,000 parking spaces and 58 lifts running at a speed of 10m / s (Fast leading). More specifically, the elevator system of Burj Khalifa tower is designed with the ability to operate independently - can evacuate the victims as quickly as possible if a problem occurs. The architect from Chicago who has designed systems bearing structure of the tower and a solid foundation for more than 160 floors above. As for the construction of this tower is made by Samsung Engineering and Construction - a building contractor from Korea. This great tower record holding world's tallest tower as noted above. However, it also brought in a record more than that. These include a significant number of titles as: The highest storey inhabited, the largest number of floors, the elevator according to the longest distance, highest lift system and the second highest observatory in the world . 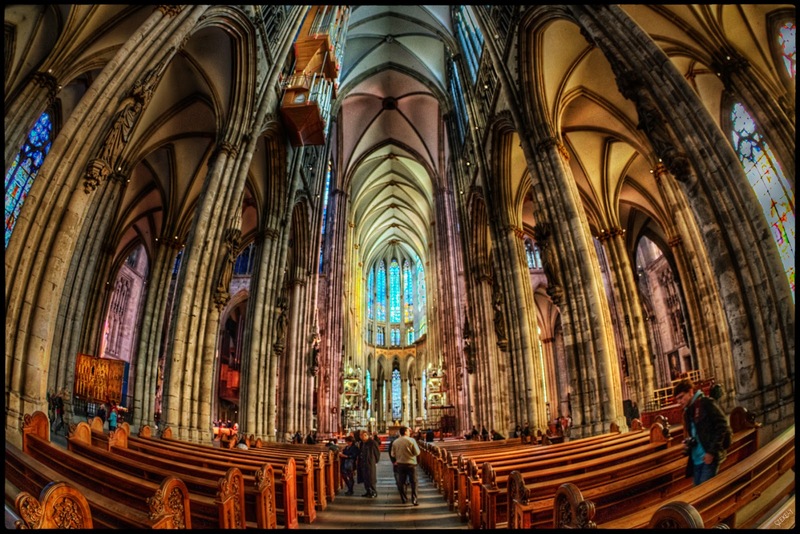 Roman Catholic cathedral is an example of Gothic architecture, and is the most crowded places in Germany. Cologne Cathedral was the residence of the Archbishop of Cologne, under the administration of the Roman Catholic Church and become famous like a monument of the Christian religion, Gothic architecture, beliefs and the persistence of people in the city where the cathedral was built. Cathedral was designed for St. Peter and Mary the Virgin Mary. Sanctuary is a world cultural heritage, is one of the architectural monuments most famous in Germany and is a major turning point in the history of Cologne, described by UNESCO as a "rarities inspiration of human creativity ". Cologne Cathedral is one of the largest churches in the world, the church was built in the Gothic style of the largest in northern Europe. 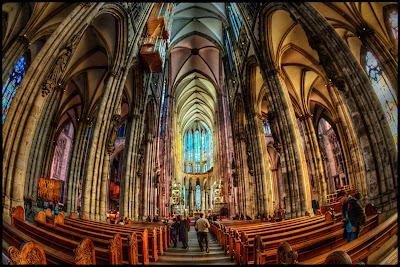 As a world cultural heritage and with a convenient location on the tourist route, Cologne cathedral is a major tourist attraction, where the visitors have included many of the pilgrims Thien not give. Sanctuary is open all day from 6:00 am to 7:30 pm, free entrance except climbed the tower and into the display area. Visitors can climb 509 stairs to spiral up to a width of about 98 meters platform overlooking the courtyard below. On August 18, 2005, Pope Benedict XVI visited the cathedral of the Pope's visit to Germany celebrate World Youth Day 2005. Approximately 1 million pilgrims visited the cathedral during dirty.